Slava Isusu Christu! Slava Vo V’iki!! 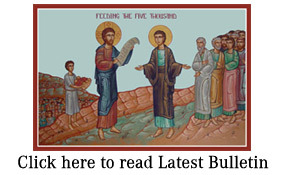 PDF of St Athanasius bulletin 9.3.14 SUNDAY OF ORTHODOXY includes many announcements for upcoming events and instructional articles about saints and liturgical questions. FIRST SUNDAY OF THE GREAT FAST. MEMORY OF THE HOLY PROPHETS. THE FORTY MARTYRS OF SEBASTE. MON. MAR. 10 The Holy Martyr Codratus and His Comp. TUE. MAR. 11 Our Holy Father Sophronius, Patriarch of Jerusalem. WED. MAR. 12 Our Ven. Fr. and Conf. Theophane of the Syrian Mountain. Our Holy Father Gregory, Pope of Rome. Our Holy Father Simeon the New Theologian. THU. MAR. 13 The Translation of the Relics of our Holy Father Nicephor, Patriarch of Constantinople. FRI. MAR. 14 Our Ven. Fr. Benedict. SAT. MAR. 15 Second All Souls Saturday. The Holy Martyr Agapius & His companions. SUN. MAR. 16 SUNDAY OF ST. GREGORY PALAMAS. SECOND SUNDAY OF THE GREAT FAST.The Holy Martyrs Sabinus and Papas.